The project was set up around four major themes Welcome, Home, Play and Country. 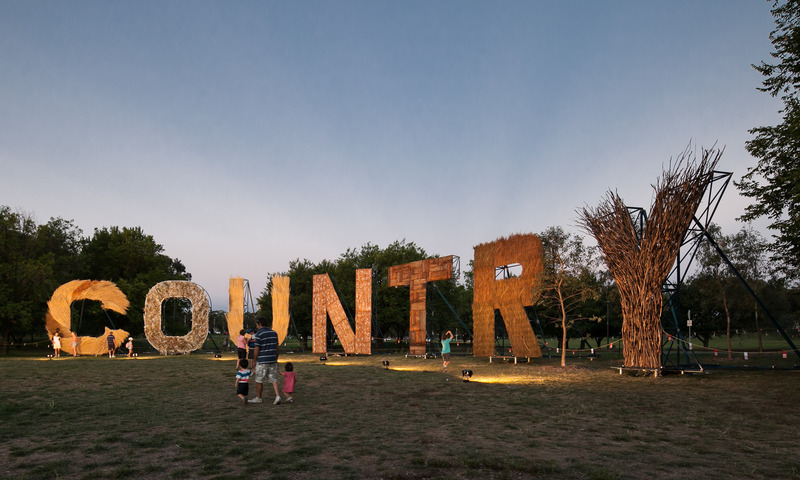 The Welcome area featured a five-metre high word, welcome, floating above a series of constructed portals that engaged the crowd as an entry point to the festival. In the Home area, Thylacine worked with 17 multi-cultural community groups to create sculptural markers for a village site at Rond Terrace. The project involved community consultation, collaborative design, design approvals and fabrication of the individual works to be installed. As a backdrop to the area, ‘Our Home’ was spelt out in paper napkins on which children at the festival drew images of their home. The Play area extended over the whole site and involved creating numerous installations that engaged with the public through words. This included: a large-scale cyclorama, woven words on fences, speech bubbles, photo frames, electronic road signs, chalk words, large foam words, crosswords, words mown into lawns, floating boat words, wooden words, character actors involved in word play, sticker letters, cardboard box words, words on bike flags and words written in the sky. The physical raising of the word Country incorporated a ceremonial event, where the letters of the word were progressively raised. Thylacine engaged artists to treat our fabricated letters spelling Country in organic materials. The letters were raised to a commissioned score and an orchestra composed of professional musicians and school bands. Thylacine was responsible for the design and fabrication of the many elements that provided visual cohesion across the celebration site. It was a challenge and achievement for us to adapt to an evolving brief and respond creatively, working with a variety of mediums from cardboard boxes to skywriting.